I’ve wanted to do this post for such a long time, but I didn’t like the handbag I had and everything in it was a mess. Anyway I think I’ve got it up to standard now and found a bag I love! First of all my black fringe bag is from New Look, and I’m so in love. Its the perfect size and is so perfect for summer. So lets start off with the random bits and bobs that usually end up scattered at the bottom of my bag. First of all, you can see my purse. I got this as a complete bargain in the TK Maxx sale a few weeks ago. It was only £5, and its such a good size. Hanging off my purse, I have my fluffy keychain thing. This was from H&M and was only £2.99, its so adorable I love it. 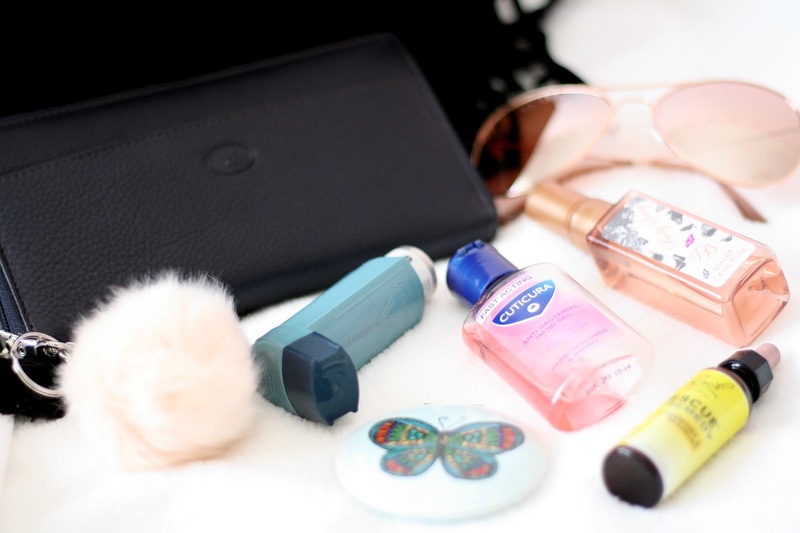 I have to keep my inhaler in my bag just in case, as I used to suffer with asthma (sorry not that interesting). I keep a pocket mirror in there too, which was a gift from my Grandparents, and it has the cutest butterfly on the front. I always have hand sanitizer to hand, especially after going shopping or something. This ones from Boots. I also keep some Rescue Remedy in my bag, because I’m an extremely anxious person and in times of need this can be really helpful. Lastly, a mini Ted Baker spray, which I picked up in Boots a while back, it smells really nice and is very handbag friendly. Now onto the small make up section of my bag. The little pouch I keep it in is from H&M, and its adorable. First of all I keep my Rimmel Wake Me Up concealer, which is my all time favourite. 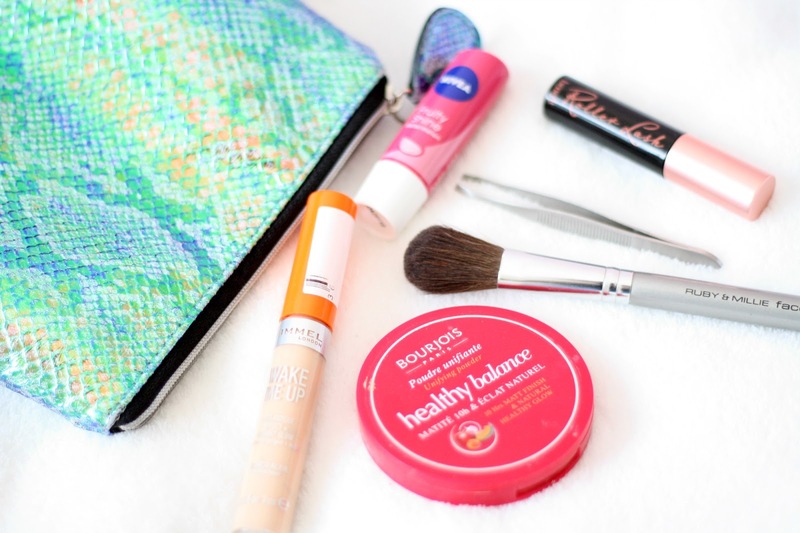 I keep my Bourjois Healthy Balance powder, because I do suffer with quite oily skin so this helps to keep my skin matte. To apply that I just have a very travel/handbag friendly makeup brush by Ruby & Millie. I’ve had this a long time, but it fits so nicely into my bag and works well. I also have some tweezers from Boots, because there’s always that annoying eyebrow hair somewhere, am I right ladies? Then my mini Roller Lash, in case I need a top up of mascara. And finally my Nivea Fruity Shine in watermelon, its so hydrating and gives such a nice shine to the lips.